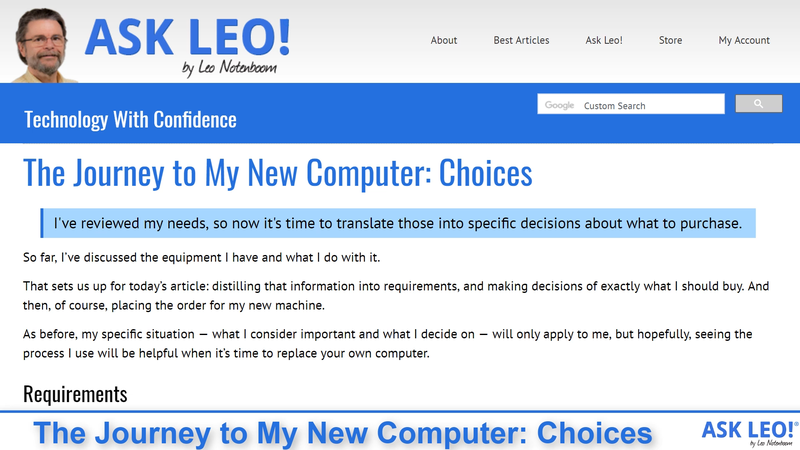 The Journey to My New Computer: Choices - Ask Leo! I've reviewed my needs, so now it's time to translate those into specific decisions about what to purchase. So far, I’ve discussed the equipment I have and what I do with it. That sets us up for today’s article: distilling that information into requirements, and making decisions of exactly what I should buy. And then, of course, placing the order for my new machine. As before, my specific situation — what I consider important and what I decide on — will only apply to me, but hopefully, seeing the process I use will be helpful when it’s time to replace your own computer. A machine that is portable: I’m replacing my laptop, after all. A machine that has a powerful CPU to make video editing responsive, and rendering (the process of producing the final video file) relatively fast. A machine that can hold lots of RAM, primarily so I can run virtual machines as well as more demanding applications like Photoshop and World of Warcraft. A machine that has a decent display: as I use it all day long, it needs to not only be clear and large, but comfortable. A machine that has sufficient disk space to store all those virtual machine images, photographs, and video files. Not very helpful, is it? I’ve basically outlined a “perfect machine”: small, fast, lots of RAM and disk, and a beautiful display. Balancing that against what’s available and how much it costs is where the difficult decisions get made. I did a little high-level research of manufacturers that would meet my needs. A cursory look at the many name brands that exist show that there are many to choose from, and they all have both horror stories and rabid fans. They can each produce lemons as well as rock-solid hardware. I settled on Dell for two reasons: they make it easy to configure what I’m looking for, and I have a long track record of success with Dell machines. When I’ve needed support, their website contained 90% of everything I’ve needed, and in those few cases where I actually needed to talk to someone or return or exchange components, they’ve been fine to deal with. I know Dell has their haters, but so does every other manufacturer. My comfort level, particularly given my own abilities to know and find what I might need, is quite high. I know I want a laptop. Even though I’m replacing both two laptops and a desktop, the ability to be reasonably portable is important. This is the machine I’ll take when travelling. What I elected to consider this time around was using a docking station with my desktop. I would be able to plug a number of devices into the docking station — an external monitor, a “real” keyboard and mouse, perhaps some additional external storage, and a wired network connection — and connect the laptop to all of it with a single connection. Dell makes several lines of laptops. I settled on the XPS 15 series. I’ve had Latitudes in the past and they served me well, but they didn’t seem to meet my more strenuous “also a desktop” needs in terms of performance. I’ve tended to shy away from Inspirons as lower-end machines, and the Precision series is too costly. Choice: Dell XPS 15 Laptop with a companion docking station. Since at times I’m a heavy processor user (video rendering, for example), I looked for both speed (Ghz) and number of cores. Purists also look at things like bus speed, cache sizes, and so on. While that can make a difference (hard-core gamers swear by it all), my personal experience is that it’s not worth my time to take things to that granularity. Speed + cores gets me what I need. Of the available options, a six-core Intel Core i7 running at up to1 4.1Ghz fit my bill. I could spend $500 more for a newer Core i9, but once again, my experience is that the absolute latest and greatest generally isn’t worth the premium in price when it’s first released. Choice: 4.1Ghz Intel Core i7 8750. What matters here is not how much RAM a machine comes with, but the maximum amount it’s capable of holding. Given my propensity to run multiple virtual machines while I’m doing other work, RAM capacity matters a lot to me. As a result, I looked for the highest option I could find. From what I could tell, the XPS series has a maximum capacity of 32 gigabytes. I made sure to select a configuration that met that need. Choice: 16GB, expandable to 32GB. Disk is a difficult question when replacing a desktop. My previous desktop had a half-terabyte internal SSD, but also an eight-terabyte external hard disk from which I did a lot of my work. Video files lived there, for example. That’s a little less practical on a laptop you plan to carry with you. My compromise was to install a one-terabyte internal SSD (again, 2TB was available, but I didn’t consider it worth the additional cost), and then plan on another external higher-capacity hard disk. The impact will be on my workflow: deciding what will live on the internal SSD, rather than assuming that the external disk would always be present, such as when traveling. Choice: 1TB SSD internal, with a multi-TB USB3 external drive to be named later. I also planned on replacing the screen on my desk. When I use it as a desktop machine, I want a (physically) larger monitor to work from. This is the one area of this process where I splurged on more than I really needed. 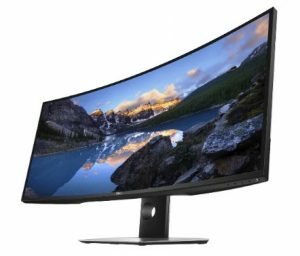 Honestly, a good 28-inch UHD monitor would do me just fine, but I elected to “supersize it” with a 38″ curved monitor, also from Dell, capable of 3840 x 1600. I also elected to purchase directly from Dell, even though many of the items above are available from third-party sellers — even on Amazon — at slightly reduced prices. I considered this choice an insurance policy: there will be no question about warranty, or who to contact, if there is a problem with anything. In the next article of this series, I’ll cover unboxing (sorry, no “unboxing video”  ), as well as my initial setup and reactions. The Journey to My New Computer: Taking Stock - It's time for me to buy a new computer, and I'm taking you along for the ride. The Journey to My New Computer: Success and Failure - My new machine is in service. Here's what I installed, how it's performing, and how at least one aspect failed. Can I Add More than One External Monitor to My Machine? - Depending on the hardware ports that you have on that laptop, you should be able to simply plug in a monitor. I'll show you your options. The Journey to My New Computer: The First Thing I Do - How I resolved a classic chicken-and-egg dilemma: I have to turn the machine on to back it up, but I want to back it up prior to turning it on. 1: The processor generally runs at a slower speed to save power and heat, but is capable of higher speeds as need warrants. 2: My prior desktop had 64GB of RAM, which I fully utilized only rarely. While I don’t expect 32GB to limit me, it was perhaps the only major step backwards on this new machine. 3: Naturally, depending on when you read this, prices, equipment, and availability may all change. « Previous post: The Deep, Dark Secret Behind Ask Leo! A personal experience with Dell support was extremely positive. The power adapter failed while it was under warranty. I reported it on their website. The next day, a new one arrived with no questions asked. No need to send the old one back to prove it was burned out. I still have the old one in my to be recycled box in my basement. I bought the machine directly from Dell. i don’t know if that gave better support than if I had purchased it on Amazon but it gave me the flexibility of specifying each component individually. Last time I set up a new Dell Windows 10 machine, perhaps a year ago, there were two different Dell programs for updating their software. The LAN Ethernet driver needed to be updated (among other stuff of course). Each Dell program wanted to update the Ethernet driver to a different version. That’s my Dell experience: two programs to do the same thing, each with different results. Fuggedaboutit. 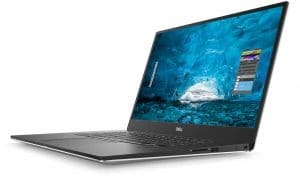 Great Choice, i have had many XPS laptops over the years and still have an XPS 15 and two XPS 13’s as well as my current which is a XPS 13 2-1, i do a bit of overseas travel and the ability to use as a pad is a bonus for me, i was a little concerned as it is fanless but have never had any issues with it. Being the gamer did you consider Alienware ? I’ve been a Dell customer since 1998 running Windows 98. I’m still a loyal customer and find it easy to configure what I want when ordering. In all those years I’ve only had to have a tech come out and replace a card reader. I seldom need their phone support. My only complaint is the phone calls I receive weekly from their tech support impersonators. What’s really irritating they know my name and they also know the service tag number, I never confirm my name or that they have the correct service tag. I don’t know how they get the service tag within a week of the purchase of a new computer. I can only block 30 phone numbers on my landline of which they use all 30. That’s scary. Is there another possibility than Dell employees going rogue, whether they let themselves be corrupted, or do the deed themselves ? How long has that been going on ? Would you be willing to share the part of the world you live in ? Thank you for sharing your hardware selection. What do you have for the external hard drive storage to store the bulk of your data? The only current Dell hardware I have is a C3765dnf color laser purchased in 9/2014. I don’t like ink jet for several reasons. I bought the extended support and have had excellent support. I have had only 3 service calls. 1) A service tech fixed a super bad paper jam. It took over an hour because it was that bad. 2) Remotely updated the drivers and microcode. 3) Problem with discoloration on one edge scanning. It took a long time for the technician to arrive. He explained the problem and did not have to replace any parts. I felt like a jerk, but that happens with computers. This prints excellent output (b&w and color), has an excellent pdf manual. The only problem is I did not research it sufficiently. The only way to scan a legal document is through the ADF, not the glass bed. The document must be physically perfect. Also, it cannot be thick paper or a book. I am thinking of replacing it. Leo, what are you using for a printer? Are you completely satisfied with it or would you “like” to replace it some day? Mostly because of the video files. I work on them on the main SSD, but then move them to the external drive when done. That and backups, of course. I have many printers available, because I service them. I’ve found that the Brother BW printers in the L/DW series are very economical. If I want color, which is not common, I go to either an HP or a Canon InkJet with 2 side print ($49, but the cartridges cost like $60 a set). So for you, consider buying a BW Laser Network printer from Brother and making it your default. Use the color when you need color. The color uses a lot of energy= you almost need a 15amp dedicated circuit for it. Be energy wise and economical at the same time. What do you think? I think you’re not wrong, but multiple printers here isn’t something I need/want to deal with. And, yeah, when the Brother spins up it pulls enough current that my UPS will often kick in. How much do you print that the cartridges last 3.5 years? And is that the cartridge set which came with the machine of the replacement cartridges? I’m assuming you mean the latter. I’ve replaced them (color == set of 4 cartridges) once in 3.5 years. I have NO idea how much I print, but given that I try to be as paperless as possible, it’s probably at the low end. The best printers I have had are Canon PIXMA series, 6 cartridge ink jet. Ink is very inexpensive through Abacus 24-7. Even for newer Canon printers you save a bunch. Pictures turn out the best I have seen – as good or better than commercial print shops. I currently use the PIXMA MG8120. The ink adsorber is getting full and I am considering the new PIXMA TS8220 all-in-one photo printer. Inks are more expensive being a new unit. I am also considering the PIXMA iP8720 photo printer for printing up to 13″ by 19″. Ink for it is same as the MG8120 so very low cost from Abacus. You are wasting lots of dollars on that 38″ monitor! My primary monitor is 4K 55″ Smart Roku TV on Black Friday for $199 from Meijer. BTW, on Black Friday, Best Buy sold 65″ 4K Smart Roku TV that I bought for the bedroom for $399 with free shipping! I thought that 55″ might be too big but I took the plunge and am so very happy that I did! With you wearing glasses, as I do, I am certain that you would benefit from a much larger screen. Recently, I have seen 55″ 4K etc. by Samsung, LG and others for $400 to $500. I also saw a Samsung curved 4K for much less than you are considering for a small monitor. It was a splurge, as mentioned, and so far I’m not at all disappointed. If I had to I could use my VGA to NTSC adaptor and either of the two 1983 Sony Trinitrons *17 and 19 inch or my CRT projectors. I’m happy with old stuff and besides that, the TVs cost all of 14 bucks at a yard sale and thrift store before they stopped carrying tube TVs and will probably outlive me. Ever had the neighbors move out and try to toss a broken 50″ in the dumpster? I don’t have a car to take that hazardous waste to the garbage company’s office and the state would fine the landlord if they found it. A 36 year old set won’t likely fall over and break so easily. Those Sony Trinitrons displayed a beautiful picture. I miss ours. Or, if you aren’t professionally gonzo (like me) and not a gamer etc. you can still live with stuff that was given to you or dirt cheap from your local Craigslist. Again, Dell is probably what you’ll end up with, HP second. Much easier to fix up a Dell, and I have nearly 30 years of experience on that (and I KNOW they haven’t been around that long). But I use desktop PCs, I don’t like laptop keyboards or wasting a screen when you are going to use your own keyboard and screen anyway plus trying to figure out multiple function chiclet keys is a non starter and the trackpad never satisfies, so all you have is a motherboard, drives and special laptop memory that doesn’t work on anything else. I would not have bought the machine if the vendor “wouldn’t” furnish it with 32 Gb ram at purchase! Secondly. I don’t understand how anyone on Earth would tolerate or put up with Dells Quirky, neurotic OS. My sister had a Dell [ desktop] years ago and she kissed the ground they day she changed and got a new computer which had a Microsoft OS. My Friend / Neighbor also had a Dell. Windows 7, until he upgraded to Windows 10 Home. Every thing was different, That included the way the remote Webcam was accessed, the taskbar, the Searching, File structure and moving files, and even the security. Windows Explorer didn’t work the same. Actually just about everything was from outer space. I used to help him weekly as he developed trouble regularly. He had the machine 6 years. I’ve worked with Dell on very large business projects. What you’ve outlined is a very good choice for you. I hope you’ve registered as a business, to get business prices and business support. Just wondering on the board: do you know if it is “burned in” as part of the manufacturing process, aka military spec? That used to be the “standard” for commercial products, but don’t know if Dell’s current board manufacturer does that. It is worth the price because it eliminates the early fails, which I can tell you from experience, are the rule for Chinese manufactured products. Your SSD is some concern to me… as long as you’ve got it backed up, as I know is your policy, you are OK. But the isn’t the normal spec for mean time to failure 10K access per cell? When you are doing video, access to a cell can add up in no time. Yes, I do register as a business. Also means I get their “business advisers” reaching out to me periodically, but that’s a cost I can easily dismiss. As I understand an SSD doesn’t usually die all at once, so you have some warning that the cells are starting to go. With the kind of backing up you do and recommend, if the SSD does die (any kind of disk can and does die), you can replace it relatively inexpensively and restore from backup in a few hours. Leo, I’m a little surprised that you did not mention the graphics systems on the laptops you were considering, especially since you are doing video editing. Is that because the models you were considering all came with discrete graphics cards that could handle the load? What do you mean by Dell’s ‘quirky OS’? Do you mean BIOS? As in setup? Around the end of the “oughts” the BIOS everyone used changed to meet the requirements of newer hardware and usage, and like with hard drive makers the BIOS providers collapsed down to a basic one or two. Dell’s setup reflects their hardware, and it’s not that hard to use once you look at it (or read some documentation on using it). Or have they started offering Linux distros, which are not Dell at all, look up Linux on your favorite search engine…I use Win 7 and Linux Mint. Linux comes in many ‘flavors’ and Mint was developed from several different components to create an OS that many Windows users find comfortable and you don’t have to be a rocket scientist to use or modify it, but you can be. Mint is merely one of many. And nothing is stopping you from installing your own OS. I would like to follow Leo’s lead because his needs match mine very closely. But I won’t use Windows 10. I just won’t. Not negotiable. 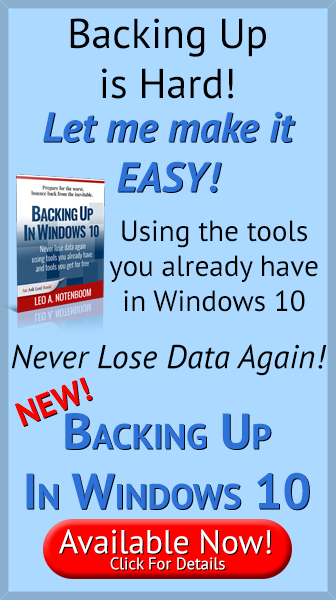 I want to use Linux with Windows7 in a VM. Anybody know whether I can specify a Dell machine which will cope with that? I tried to specify it myself and failed but that could just be me. You can install a dual boot if you wish. Dell can provide a machine without anything loaded but Windows 7 is no longer available from computer vendors. It was superseded by Windows 8.1 a few years ago and 7 dates back to around ten years ago. But if you have only one drive, you have to install both on one drive. Having a virtual setup seems like a bit of a fuss when you can just choose when you boot. I had one set up that way with two drives, one with 7 and the other with Mint 13 Maya. Make sure that your drive is large enough and that you can set your partitions to handle them. @Steven: I like doing the VM. It means I’m running two OSes at the same time. I can flip between the two as easily as flipping between two different programs running in one OS. I can easily transfer a data file generated in one OS to the other OS as simply as copying a file over the network. I don’t know how you do that very easily in a dual boot, other than saving to a USB memory stick. Shutting down and rebooting into the other OS, then copying and deleting from the memory stick. That seems like a hassle. My machine already runs Windows 7 in a VM (which is running in Windows 10). Honestly, you don’t need a VM. You should be able to install Linux directly if you like. BTW I bought a legal copy of Windows 7 last year for the new computer which runs the principal navigation systems on our motor yacht. So it is still available. How are you finding the TB16 Leo? I have one attached to a Dell 9570 which is driving two screens and two external HDs. The Thunderbolt connection to the computer is flakey, affecting all attachments. For me another big factor in choosing a laptop is weight. Because of tailored applications that I use in my business I need a 17-inch display with a minimum of 16GB RAM and at least a 1080p (1920×1080) HD display. And because I must travel a lot weight is a major factor. Too many times I’ve had to run from one end to the other of Denver International Airport or Los Angeles International Airport to catch a connecting flight while lugging my very heavy HP Envy. So I’ve been searching for a lightweight 17-inch for years now. Finally found it! Last December the 17-inch LG gram came out. It’s not configurable (at least right now) but it meets most of Leo’s requirements. And it weighs less than three pounds. As for being able to hold many virtual machines? Forget it. I run my 300GB and 600GB VMs from an external drive. Just about as fast as an internal drive. One thing which might be important is where to purchase your computer. I’ve bought all of my hardware from MicroCenter for the past 10 years and had very good results. One laptop I bought had a faulty keyboard. It was under warranty. They asked me to leave the machine and come back a week to 10 days later. I told them I needed the machine to work and asked if there was any way they could order the part and let me keep the machine. They checked with the supervisor and said they’d call me when the keyboard came in. It took 10 days and when I came in I left the machine and went shopping in the supermarket. About an hour into my shopping, they phoned and said it was ready. Now 8 years later, I still have that computer working. That’s one major advantage of buying from a reputable shop. If I had bought online, I would have gone a couple of weeks without my laptop. I know you decided to buy Dell direct but I offer the following from Costco. My experience with them is warranted service is by Dell. Free Call of Duty®: Black Ops 4 Digital Download Code with Purchase 12/6/2018 – 4/30/2019 or while supplies last. Redeem by 5/31/2019. Please see program terms below. Thanks for posting this. My Thinkpad Yoga is 4.5 years old and I’m thinking of a new machine. My main reason: my 30 GB SSD drive is not enough. Do I get a new SSD drive, do I get a new computer, or do I just use an external drive? I’m still contemplating. I just dread doing all the research for my criteria (though I’m good at it). This isn’t necessarily a recommendation for you as your needs may be different from mine. For me, it’s mainly a question of economics. I personally upgrade everything I can before getting a new machine. I max out the RAM and upgrade the SSD, and if it’s a desktop, I’ll upgrade the graphics card. I even have a 9-year-old Sony Vaio with Windows 10 upgraded with RAM and an SSD which I keep at work. It starts up and runs faster than many colleagues’ newer machines.